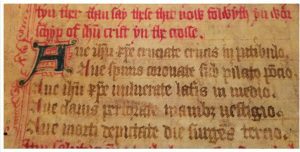 (March 2018) In the last weekend of March I had the opportunity to participate in the Digital Editing and the Medieval Manuscript Roll (DEMMR) workshop at the University of Pennsylvania. As someone with very little training in computer programs, and no experience at all with coding, I was very nervous to step into the digital world. 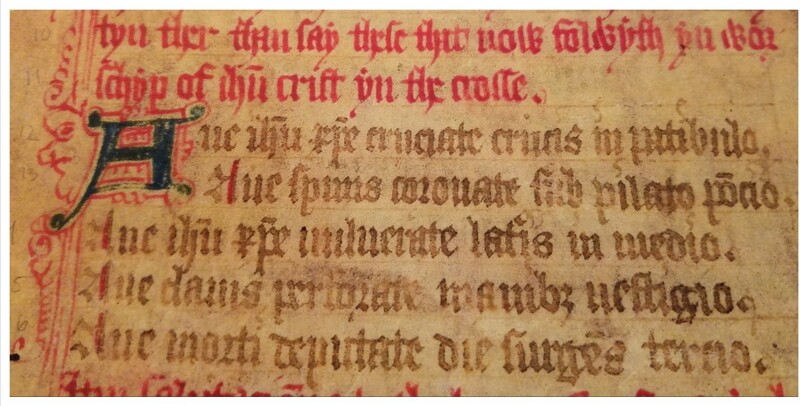 At the UPenn campus I joined a group of medievalist students to learn about manuscript transcription and editing, the basics of XML (Extensible Markup Language), TEI (the Text Encoding Initiative), and to discuss broader issues of the digital humanities. We were each assigned a section of a medieval roll in the collection of the University of Pennsylvania (MS Roll 1563) that we were to transcribe and translate into code, so that the object will have a virtual copy in the digital world and be searchable and accessible to anyone on the internet. I did not immediately take to coding, and it took trying and failing several times for me to produce a section of good code, but eventually I began to see the patterns in what at first seemed to me to be random groupings of letters and symbols, and the more I wrote, the more the process made sense to me. So, I am happy to say that I did develop a new skill that I hope to apply to future projects in the digital humanities.